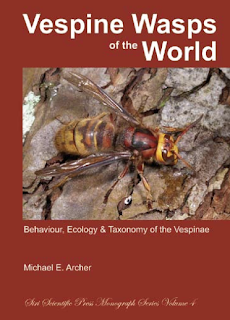 Some information on a new book by Michael Archer, which at least one member assures me is quite good. Looking forward to seeing it up close! 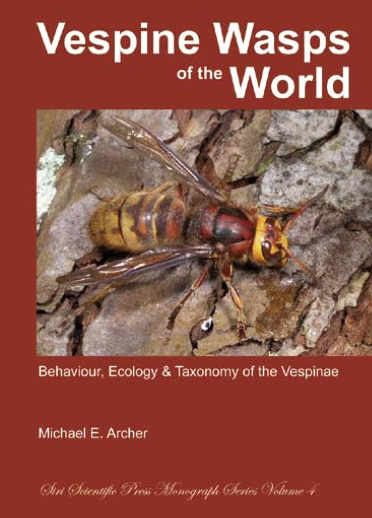 More information (including discount info) available in this PDF flyer Vespine Wasps of the World. Note: The following article by Friedrich Gess and Sarah Gess was slated to be published in the latest issue of Hamuli. The editor regrets the omission. The Albany Museum, Grahamstown, holds “the most important collection of southern African aculeate wasps” (James Carpenter in letter 16 July 2010) and the collection of bees which offers “the most important and extensive data resource on flower visitation by southern African bees” (Michael Kuhlmann and Connal Eardley, 2012, in Evolution of Plant-Pollinator Relationships edited by Sébastien Patiny). Many of you, members of the International Society of Hymenopterists, have borrowed specimens from the collection for taxonomic studies and as a result have type specimens housed in this collection. The collection was built up over the past 44 years under the curatorship of Friedrich Gess largely through research undertaken by himself and Sarah Gess on aculeate wasps and bees in the semi-arid to arid areas of southern Africa. Major contributions were also made by Charles Jacot Guillarmod who, as Director of the Albany Museum, determined with Friedrich Gess that the specialisation of entomology at the Albany Museum should be aculeate wasps (bees being included as specialised wasps!) and Alan Weaving as Assistant Curator (1981-1996). Since the retirement, at the mandatory age of 65, of Friedrich Gess (now Curator Emeritus and Contract Researcher) and Sarah Gess (now Contract Researcher) in 2001 and 2003 respectively there has been only one entomologist, a Dipterist, employed in the Department of Entomology and Arachnology on a three year contract (2005-2008). The department has been kept alive and running by the voluntary unpaid efforts of Friedrich and Sarah as official Acting HODs. The only permanently employed staff member is an Auxilliary Services Officer working as a laboratory assistant trained in house by the Gesses to undertake such jobs as replacing fumigant (camphor blocks) in insect drawers, topping up of alcohol in the wet collection and constructing unit trays. The only other person working in the department is a data capture assistant employed by Sarah Gess on outside funding. The two entomologists posts are currently frozen as are all vacant posts in the Eastern Cape Museums which all, regardless of whether they are history/cultural history or natural history museums, fall under the Department of Sports, Recreation, Arts and Culture of the Eastern Cape Government! All natural history collections in South Africa were audited by a team from NRF/SANBI (National Research Foundation/South African Biodiversity Institute) more than two years ago. The report was submitted to NRF but has not yet been released awaiting a reaction from the national Department of Arts and Culture under whom all the South African museums fall. Formerly the museums fell under the Department of Arts, Culture, Science and Technology but this department was split into two departments DAC and DST. DST has also received the report but there has to date been no comment. In order to give the collections of wasps and bees in the Albany Museum some support for at least the next three years Sarah Gess put together a proposal to JRS Biodiversity Foundation which included a salary for a well qualified collections manager, a compactor and extra insect cabinets (floor space and cabinet space having been filled). The proposal, one of 408 considered by JRS, reached the final with 30 others. Hopes were high but were then dashed. An award was not made largely due to the fact that although there is an excellent foundation for the bridge on this side of the river the distance to the other bank and the nature of the other bank is not known.